For most of the first 30 years of his career in music, Johnny Marr was happy to be the guy with the guitar, who played second fiddle to the singers in his various bands. Best known for his still-iconic work with Morrissey in The Smiths, he also been a member of The Pretenders, The The, Electronic, Modest Mouse and The Cribs, as well as being a prolific session musician. In the last few years, however, all that has changed, and he has stepped up the mic as the main man in his own band. He’s released three solo studio albums, all of which have made the Top 10, showing that there is still a market for guitar-based indie-rock if it’s done well. Many have tried (and failed) to emulate his distinctive chiming guitar style, and he’s generally accepted as one of the finest players of his generation - if not the best. That’s why, while his former bandmate seems to alienate as many people as he pleases these days, you’ll scarcely hear a bad word about Johnny Marr. 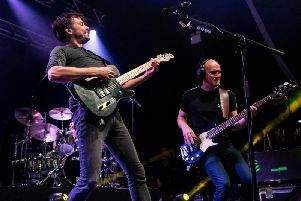 This gig was part of a tour to promote his most recent record, Call The Comet, which came out in June, and gave him his biggest solo success to date, reaching No.7 in the UK charts. The setlist understandably leaned heavily towards the album, with nine of its dozen tracks getting an airing, with Day In Day Out and latest single Spiral Cities probably the pick of the bunch. The shadow of his former group loomed large, of course, and when he threw in the crowd-pleasing Bigmouth Strikes Again as the second song, you might have guessed it might be a good night for Smiths fans – and there were plenty of them here. It was the first of six songs by his alma mater, the others being The Headmaster Ritual, Last Night I Dreamt That Somebody Loved Me, How Soon Is Now?, and, as the last two of four encores, There is A Light That Never Goes Out and You Just Haven’t Earned It Yet, Baby. Some of them worked better than others, having been written for Morrissey’s voice not Marr’s, but How Soon Is Now? stood out as the stonewall classic it is, and was probably the best song of the night. Interestingly, Morrissey and his band played the same song when they were last in town a few months ago, but I know whose version I preferred, and it’s not the singer’s. Another high point of the night was the excellent Getting Away With It, one of two songs in the set which Marr wrote with New Order’s Bernard Sumner as Electronic. Only a couple of tracks from the first two solo records made the cut, but one of them, Easy Money, with its catchy-as-hell chorus, got the best reaction and the biggest singalong of all the solo material. Backed by a superb band (with Iwan Gronow on bass and Jack Mitchell on drums as good as any rhythm section I’ve seen in a long time), Marr put on a 90-minute+ show which will have sent all but the hardest-to-please fans home happy.